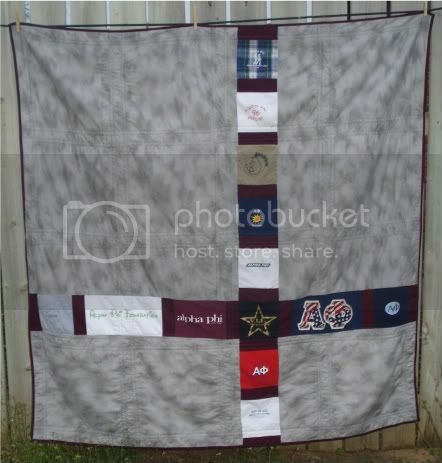 Katie Mae Quilts: Alpha Phi T-Shirt Quilt - Finished! Alpha Phi T-Shirt Quilt - Finished! Just in time to be shipped off with my friend. :( The joys of military life. I can see why quilters don't like t-shirt quilts. This thing was darn near impossible to quilt, and ended up with a lot more puckers than I'd like. But in the end, it looks pretty nice and it's big and cuddly - about 66x66. I was able to put together the back exactly how I wanted it, with no piecing of the gray. The biggest piece was 37x43 - cutting it really close - but it worked! It's not as wobbly as it looks in the pictures. It's just very heavy for my usual photo set up! This was my One Thing, One Week Challenge. Well done! It looks full of interest--and memories? I'm sure it will be well received! 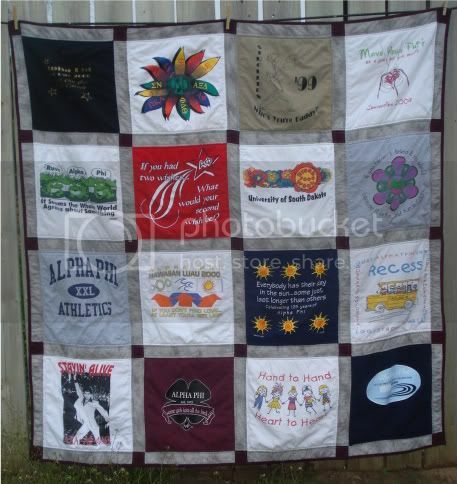 Great job, I never wanted to do one of those T-shirt quilts for that reason also, but yours looks great! I love t-shirt quilts. They're so much fun to just look at. Nice finish! Like the back also...Congratulations. That looks great. Good job getting it done on time for your friend! Charm Pack Quilt Along - Finished!